This product specification describes the technique standards,test methods and precaution notes of prismatic type( Lithium ion) LiFePO4 rechargeable cell,manufactured by Shenzhen Topband Battery Co.,Ltd. 4.1.1 All tests defined in this Product Specification are conducted at temperature 25±2 ℃,humidity 15%～90%RH,atmospheric pressure 86～106kPa. 4.1.2 Unless there are other special instructions,all performance was tested with unused cells within 1month after production date. 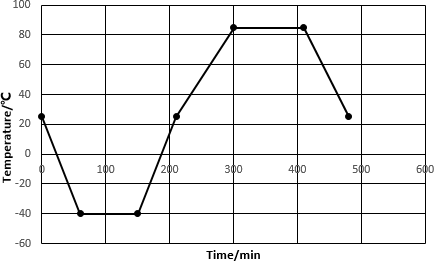 The "Standard Charge" means in an ambient temperature of 25±2 ℃,the cell was discharged with 1C constant current to cut-off voltage 2.0V,standing 1hour.Then charged it with 1C constant current to 3.65V,then change into constant charge mode,until the charging current down to 0.05C,then stop charging and standing 1h. 25±2 ℃ for 4h then check its appearance. 2, No deformation, No crack. place it in the ambient temperature of 25±2 ℃ for 4h, then check its appearance. 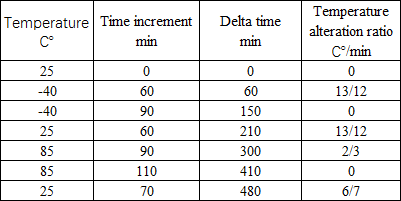 Under the ambient temperature of 25±2 ℃ a.Discharged to 2.0V with 1C constant current,stay for 1h. b. Charged to 3.65V with 5C constant current,stay for 1h. c. Discharged to 2.0V with 1C constant current. 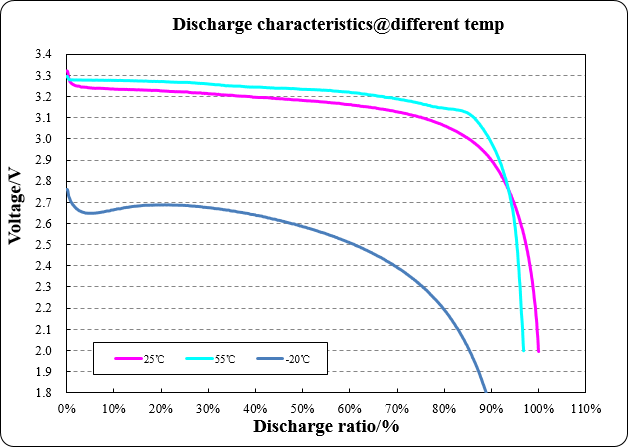 The cell was charged in accordance with 4.2,then discharge to 2.0V with 10C current in an ambient temperature of 25±2 ℃. The cell was charged in accordance with 4.2,and stored in an ambient temperature of 25±2 ℃ for 28 days,and then discharged to 2.0V with 1C constant current. at a vacuum of -90KPa,after that put the cell in room temperature for 6h,then check the cell's appearance. The Cell shall be shipped by insulated packaging and in voltage range of 3.300±0.030V, and 50% SOC, or in accordance with customers’ requirement.The remaining capacity before charging shall depends on the storage time and conditions.To ensure the cells in a good transport environment is necessary. 10.1 In this specification, quality assurance protocol is the main quality assurance protocol if it conflicts with the quality assurance protocol. 10.3 Shenzhen Topband Battery Co.,Ltd will not undertake any responsibility for breach of safety operation problems. 10.4 Shenzhen Topband Battery Co.,Ltd shall be exempt from warranty for fault cells come from by matching electric circuit connection, other battery packs and charger. 10.5 It's out of guarantee servie by Shenzhen Topband Battery Co.,Ltd after customer assemble the cell(if the cell is bad in the proces of assembly). This specification was developed after consultation between the parties.For projects not included in this specification, Shenzhen Topband Battery Co., Ltd.does not undertake quality assurance. Abusive use of (lithium-ion) LiFePO4 rechargeable batteries would cause damage to the cell and/or personal injury.Please read the precautions and safety instructions below before using. a.Do not expose the cell to extreme heat or flame. b.Do not short circuit, over-charge or over-discharge the cell. c.Do not subject the cell to strong mechanical shocks. d.Do not immerse the cell in water, or get it wet. e.Do not disassemble or modify the cell. f.Do not handle or store with metal objects like necklaces, coins or hairpins, etc. g.Do not use the cell with conspicuous damage or deformation. h.Do not connect cell to the plug socket. i.Do not touch a leaked cell directly. j.Do not mix the new and old Lithium-ion cell and use together. k.Do not expose the cell to blazing sun (or in heated car by sunshine). l.Keep cell away from children and pet. m.Do not nail into the cell, strike it by hammer or tread it. n.Do not impact or throw the cell. o.Do not direct contact the cell positive and negative electrode with aluminum case. a.Charge the cell in a temperature range of 0°C to 45°C . c.Use a matched or recommend (CC/CV) lithium-ion (Li+) battery charger. a.Recommended cut-off voltage is 2.0V.Recommended max continuous discharge current is 3C. 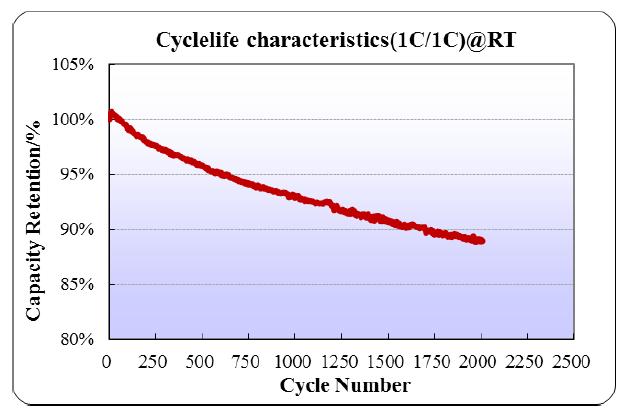 b.For maximum performance, the cell should be discharged in a temperature range of 0°C to 35°C. a. To protect the cell, good storage environment is necessary. –10~+30°C , low humidity, no corrosive gas atmosphere. c.Do not press the cell. 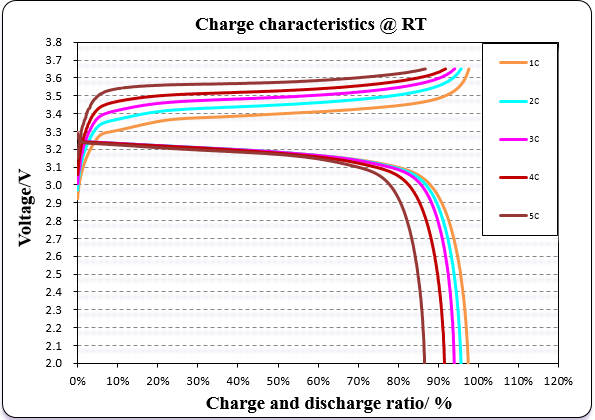 d.Charge and discharge the every 3months is recommended, charge and discharge the cell every 6months is obligatory. 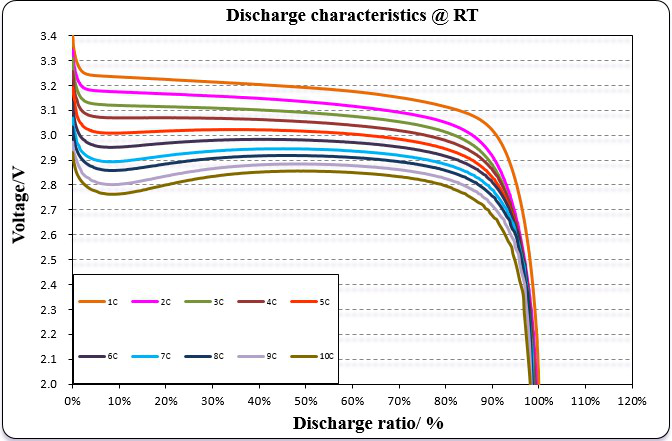 In temperature of 25±2 ℃, 1C discharge to 2.0V, stay for 30min,1C CC/CV charge to 3.65V cutoff 0.05C, stay for 30min,1C discharge to2.0V, stay for 30min ,1Ccharge for 0.5h. Note 1.The customer is required to contact Shenzhen Topband Battery Co.,Ltd in advance, if and when the customer needs other applications or operating conditions beyond those described in this document. Note 2.Shenzhen Topband Battery Co.,Ltd shall take no responsibility for any accident when the cell is used under other conditions than those described in this specification. 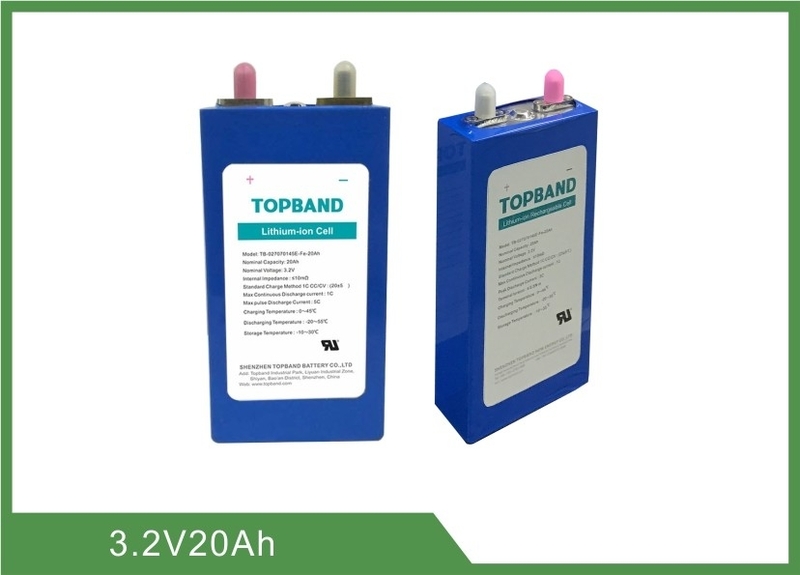 For safety assurance, please discuss with Shenzhen Topband Battery Co.,Ltd in advance for your equipment design, the circuit protection of battery/cells, high rate discharge, rapid charge and other aspects of special application.